Crean was one of ten children. His family was Roman Catholic. He left school at age 12 so to help out on the family farm. At the age of 15, he enlisted in the Royal Navy. Crean advanced through the ranks to be a petty officer. But something happened and in December of 1901 he was put back to being an able seaman, at the time he was aboard a ship in New Zealand. Crean's ship was ordered to assist Scott's ship, Discovery, when it was docked at Lyttelton Harbour. "When an able seaman of Scott's ship deserted after striking a petty officer a replacement was required; Crean volunteered, and was accepted." And so, he was with Scott in the Discovery Expedition (1901�). Overall, things must have worked out, well, between Scott and Crean2, as, Scott choose him to go on the Terra Nova Expedition (1910�12). Crean's third and final time in the Antarctic was with the Imperial Trans-Antarctic Expedition on Endurance led by Shackleton (1914�); he served as second officer. The members of this last expedition went through a dramatic series of events including "months spent drifting on the ice, a journey in lifeboats to Elephant Island, and an open boat journey of 800 nautical miles (1,500 km) from Elephant Island to South Georgia. Upon reaching South Georgia, Crean was one of the party of three which undertook the first land crossing of the island, without maps or proper mountaineering equipment, to get aid. "3 Shackleton and his men made it back to England without loss of life. 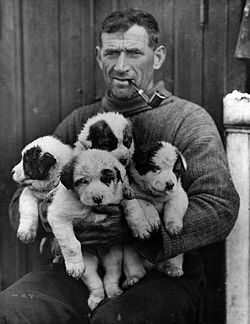 Our main interest in Crean is in his contributions to Scott's Terra Nova Expedition (1911�). They were considerable. 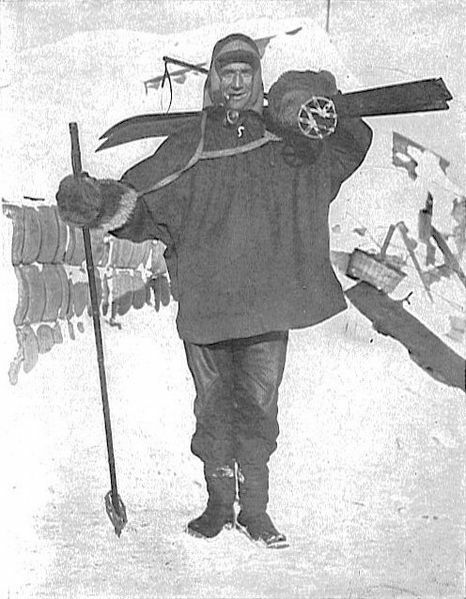 First off he was one of the few men in this expedition with any polar experience. His agility and bravery was shown on a number of occasions. For example, there was the time that he, with Cherry and Bowers, a disaster was averted when the three of them camped on unstable sea ice. In the morning they found themselves a drift on an ice flow; it was Crean who leaped from one cake of ice to another until he reached solid ice and was able to get help. Another event worth referring to is the time when Crean walked alone, 35 miles, across the Ross Ice Shelf to save the life of his fellow explorer, Edward Evans. From our larger article on Scott's journey to the pole we see where Crean started out with Scott on November 1st, 1911. And was, with him through all of the stages except for the last 167 miles. On January 4th, 1912, Crean's party was ordered to return to base while Scott went on with four others. We read where Crean's biographer (Michael Smith) suggested that Crean should have been selected for the polar party. That he should have been chosen before Edgar Evans, who was "weakened by a recent hand injury." (Of which, Scott may not have been aware.) Everyone knew Crean as being the toughest of the lot. After all that he had given -- in pursuit of the goal: Crean "wept at the prospect of having to turn back so close to the goal." And, I might add, Crean does not strike me to be of the weeping kind. Upon leaving the navy in 1920 Crean moved back to Annascaul, County Kerry, where he and his wife opened a public house called the "South Pole Inn." He lived there "quietly and unobtrusively until his death in 1938." He apparently put his naval mementos and his polar metals away, not to bring them out, or to ever talk of his adventures. In 2001, a one-man play, Tom Crean � Antarctic Explorer, came out which was performed by its author Aidan Dooley. Crean's two surviving daughters, Eileen and Mary, both then in their eighties, knew very little about their father's feats at the south-pole.